Google is no longer censoring its search engine in China — now hosted in Hong Kong — and now it seems likely that the Chinese government will start blocking more Google sites. So Google is hosting this handy “China service availability” status page — dubbed the “Evil Meter” by Wired’s Steven Levy — showing what is blocked in China and what isn’t. Unfortunately, it seems to be on one-day delay. 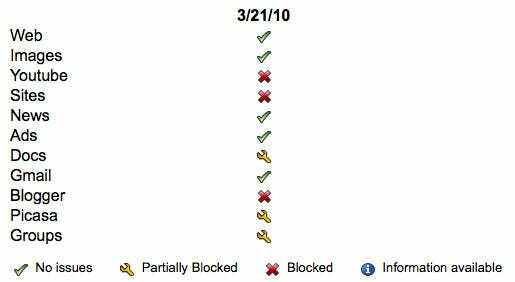 As of yesterday, for example, Google’s YouTube and Google Sites were blocked in China, as well as Blogger. Google’s Web and image search, News, Ads, and Gmail were not blocked. Docs, Picasa, and Groups were partially blocked.